I really think that this has been my most productive week to date and it is so rewarding! 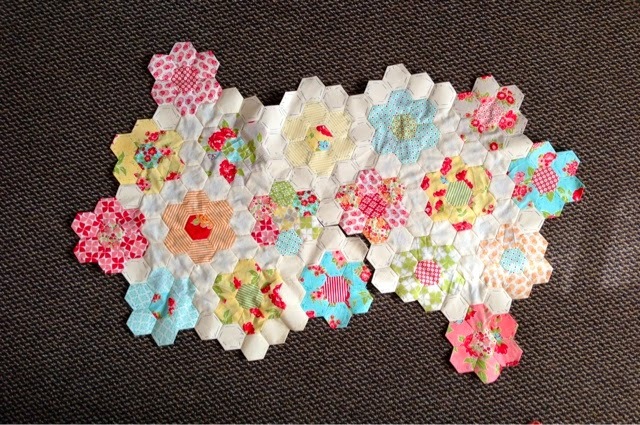 I stitched several flowers into a section and then began to join two sections together. It is really starting to look like a quilt :) It currently measures 52" at its widest point and has convinced me that I can do this! Because I keep going between our summer place and home, I decided to keep large piece and all the flower sections at our summer place. I seem to have more time there to focus and design. And I find the ocean so inspiring! In the picture below, the flower sections that still need to be attached are stacked and sorted by color value. I have 39 to join at this point. 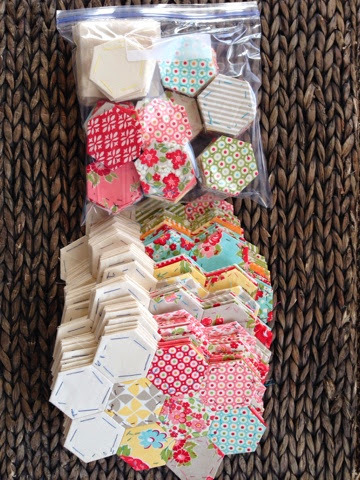 Also in the picture below is a Ziploc bag of my remaining hexagons that need to be stitched into flowers and have background hexies attached. I will keep this baggie at home where my time is more constrained. I am linking up with Jessica at Life Under Quilts for Monday Morning Star Count. Stop by and check out the wonderful progress or join us and get your own dose of inspiration and encouragement!